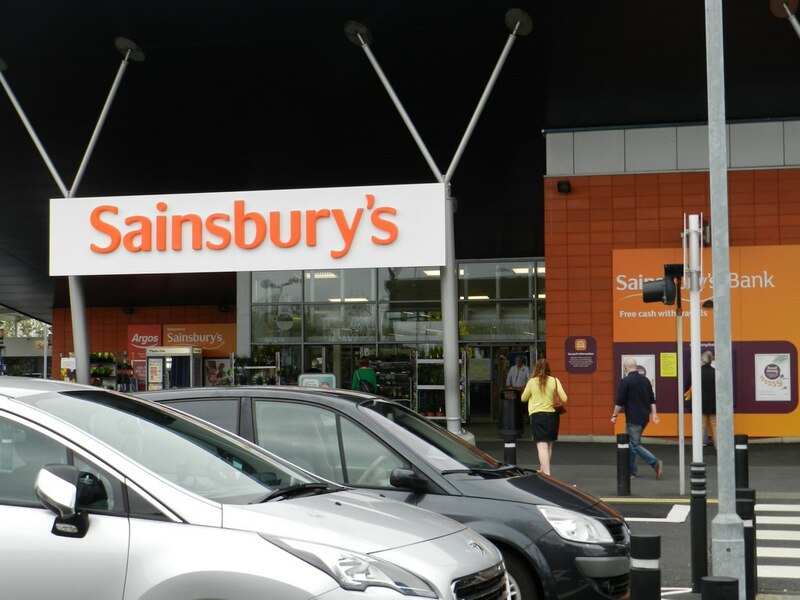 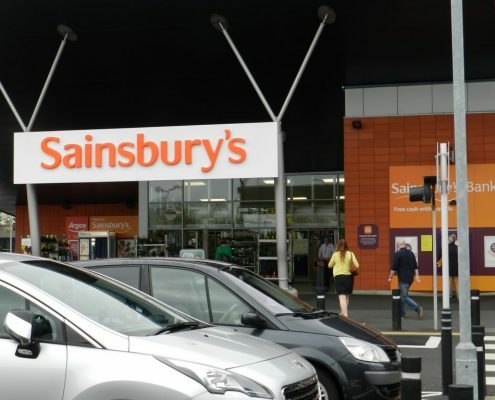 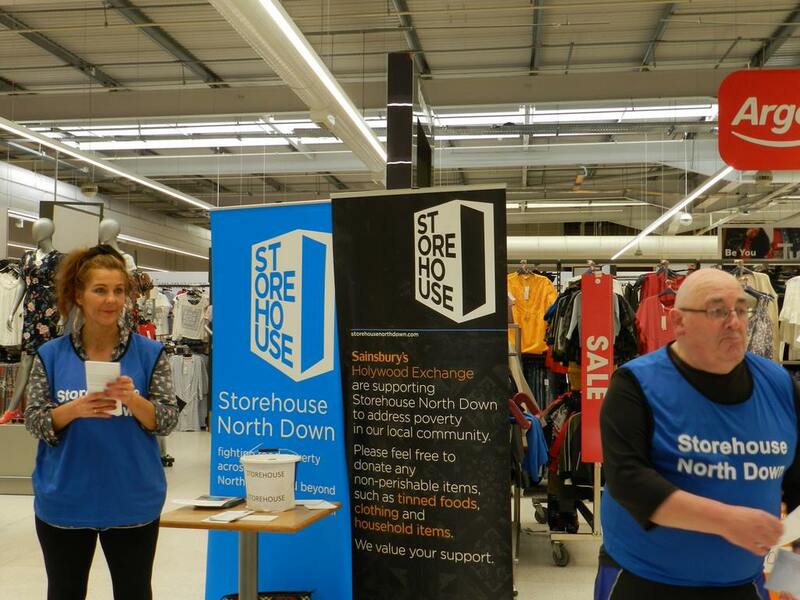 Thank you to Sainsbury’s who invited us to their Holywood Exchange shop Saturday 5th May. 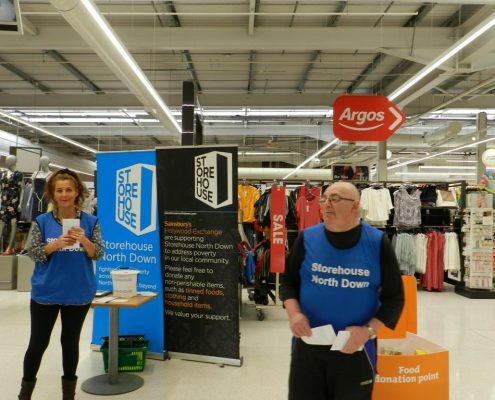 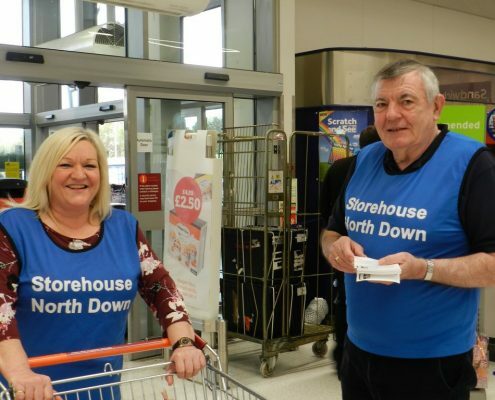 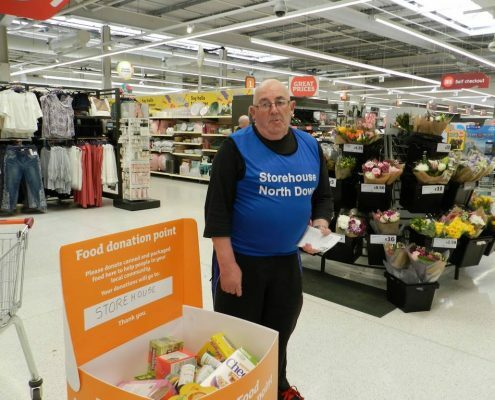 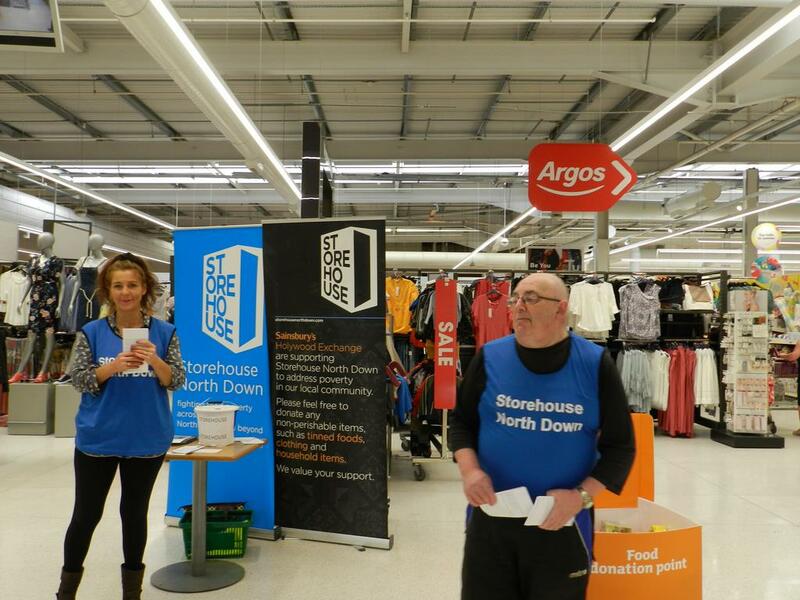 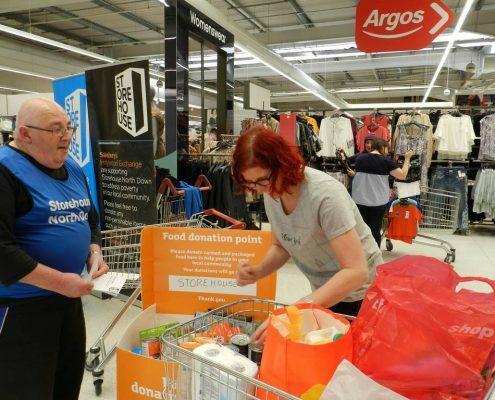 Storehouse North Down volunteers, wearing tabards, approached customers as they entered the shop and asked them to buy something extra to donate to the food bank. 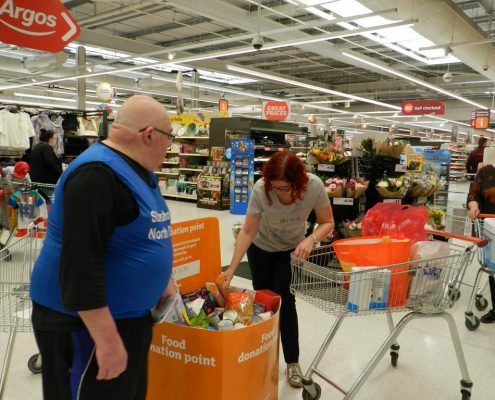 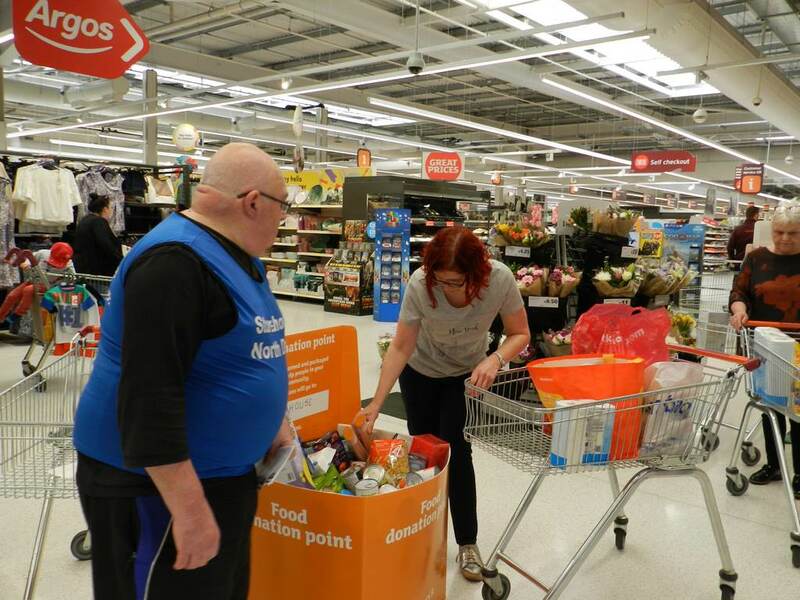 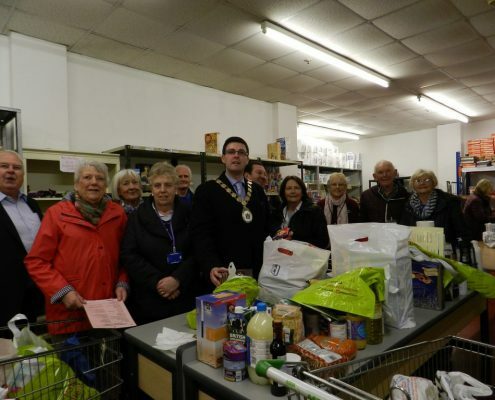 People were so generous and 23 trolleys were filled to overflowing! 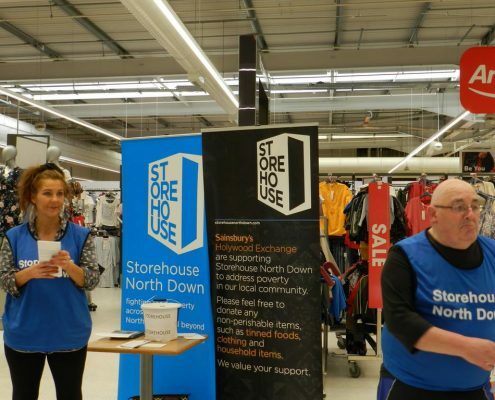 This is a very good start to the summer season at Storehouse. 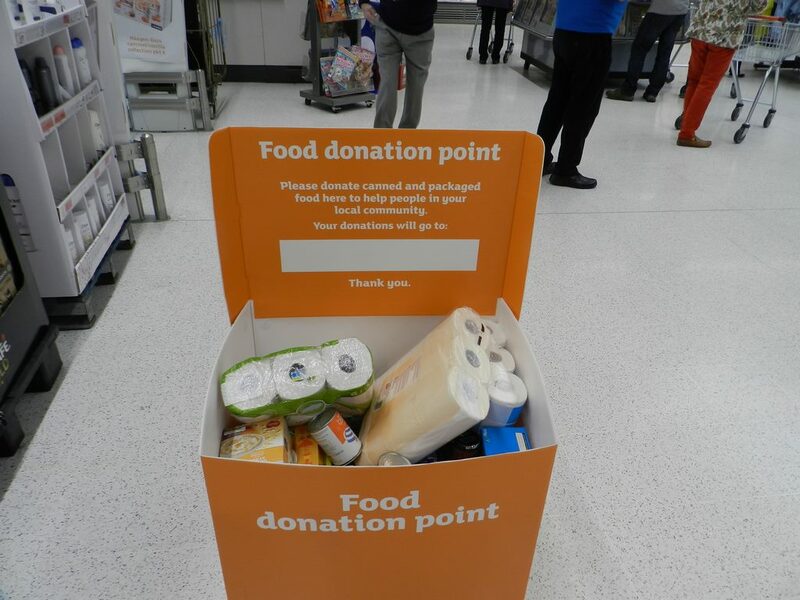 Big thanks to all who donated food or money to our funds. 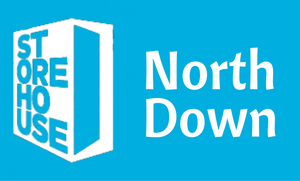 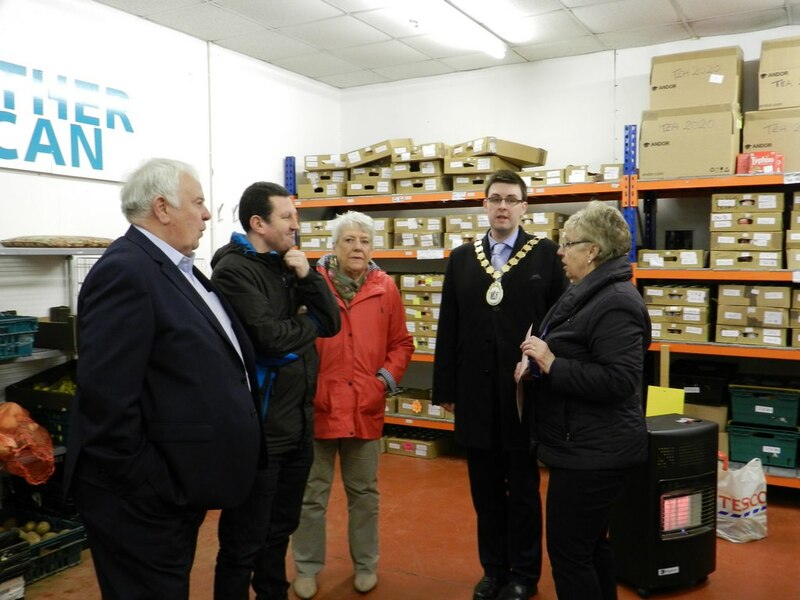 Mayor of Ards and North Down, Robert Adair, visited the warehouse of Storehouse North Down (SND) on Thursday 12th April. 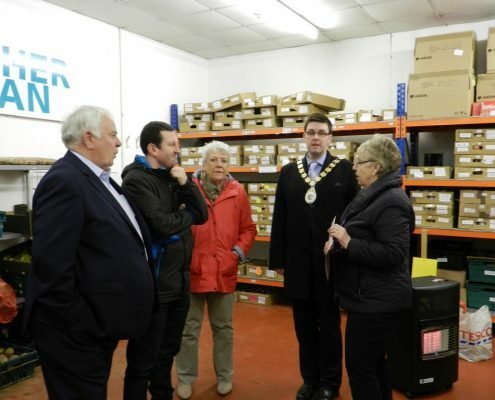 He was accompanied by Councillors Wesley Irvine, Bill Keery and Roberta Dunlop. Chairperson of Storehouse, Margaret Bailie, welcomed the Mayor and introduced him to Pauline Hare, the Assistant Director and other volunteers who were working that day. 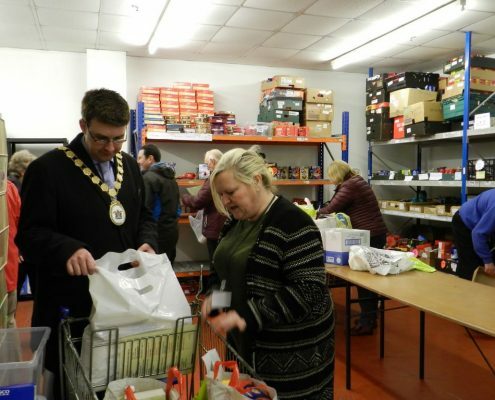 Volunteers assemble food hampers each Monday and Thursday, which cater for the needs of the particular individual or family, and help deliver these. 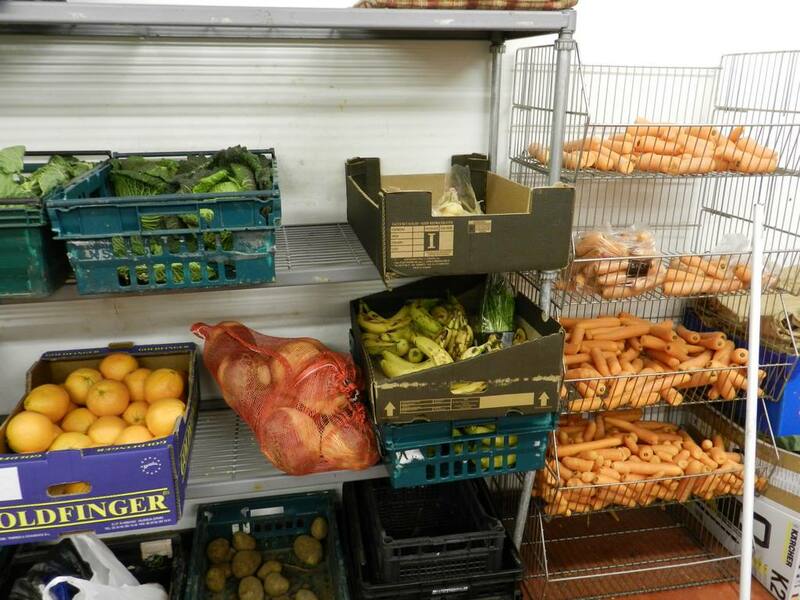 Since last year Marks and Spencer have also donated unsold food, flowers and other items. 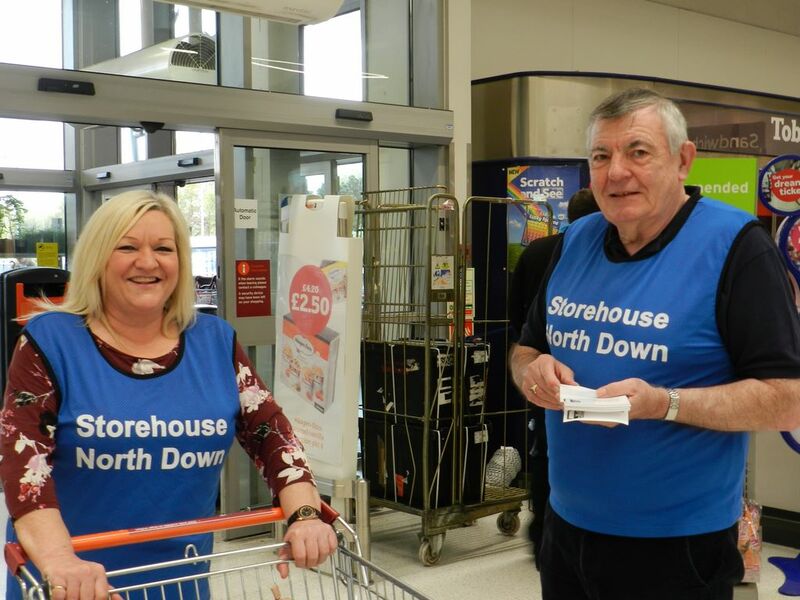 In the last 12 months 1,744 hampers have been delivered by Storehouse North Down, including 500 Christmas hampers, coming to a total value of £92,870. 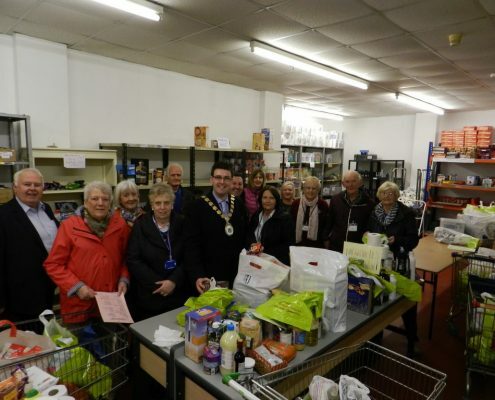 The food and money to provide these hampers is donated by local churches and others. 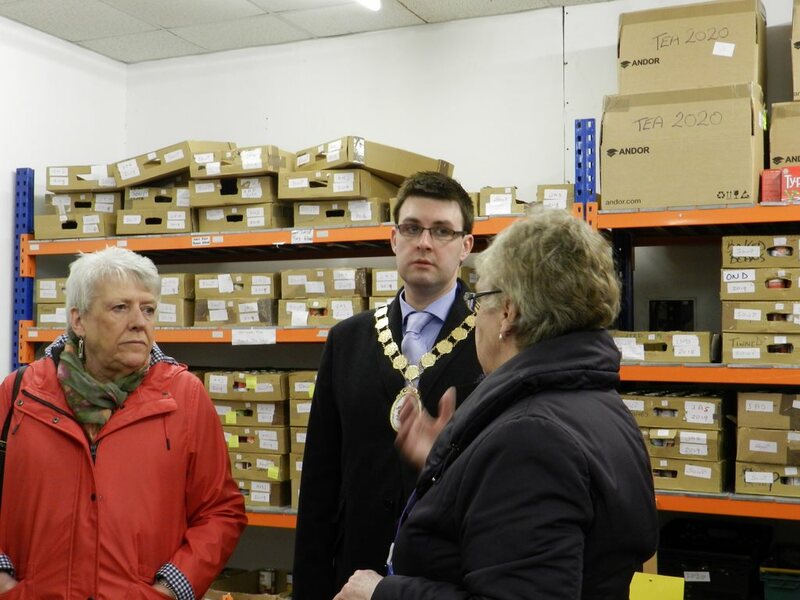 In welcoming the Mayor Margaret Bailie explained that the work of Storehouse has only been possible over the last 6 years because of the 48 churches who support it from Holywood and Bangor, Conlig, Donaghadee, Greyabbey, Groomsport and Cloughey. 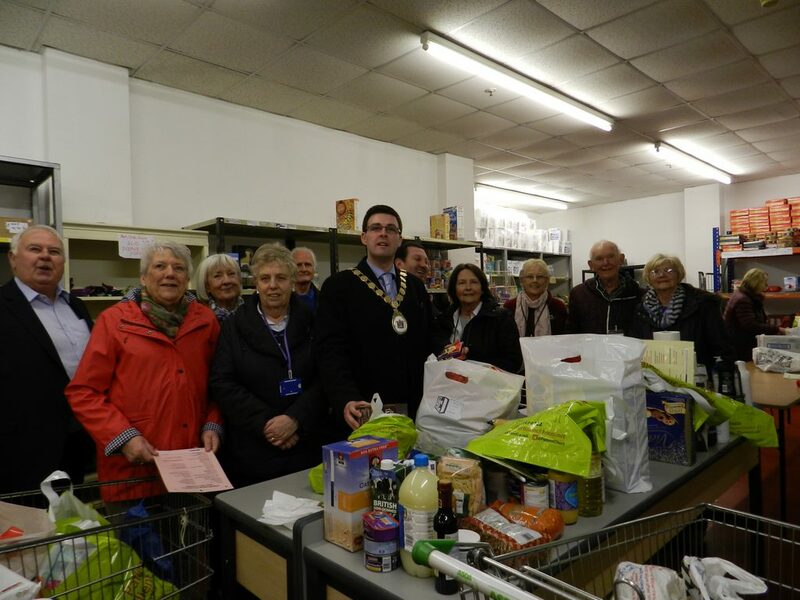 People donate food, toiletries, cleaning items and vouchers or money. 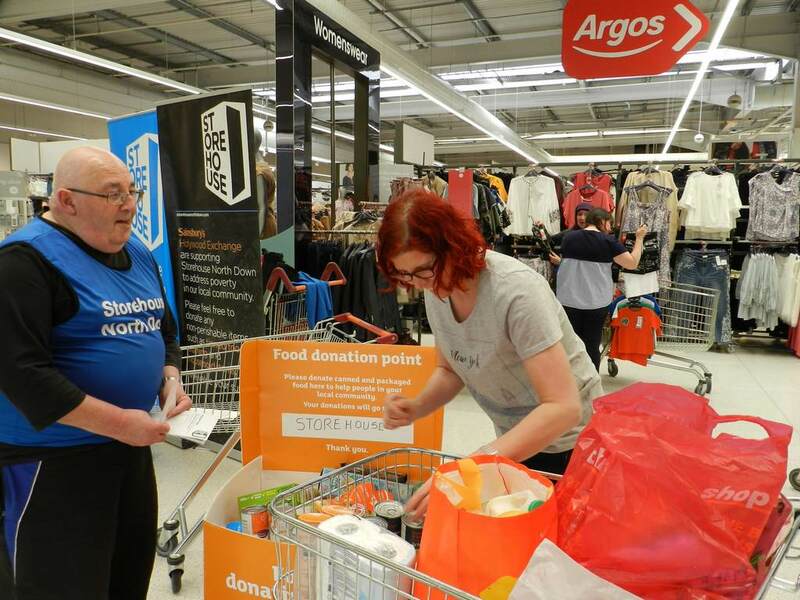 She thanked everyone for their generosity to those in need. 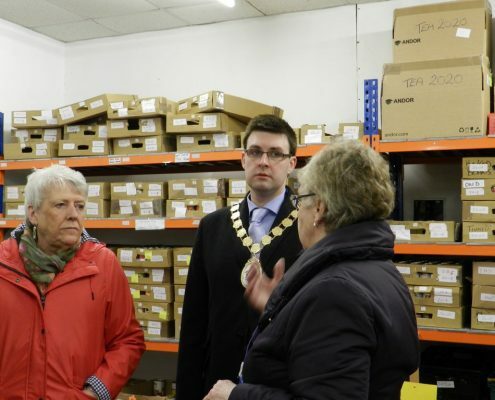 She also thanked members of the public, local businesses and schools for their support with donations. 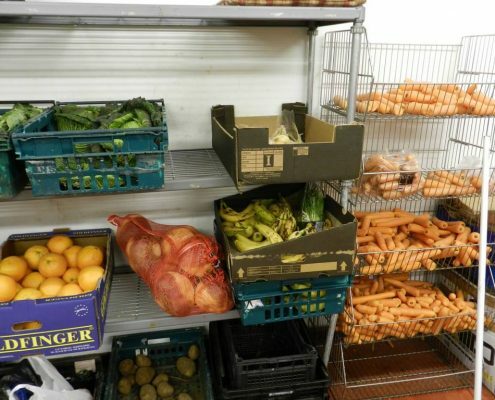 Farmers on the Ards Peninsula provide fresh potatoes and vegetables for the food hampers. 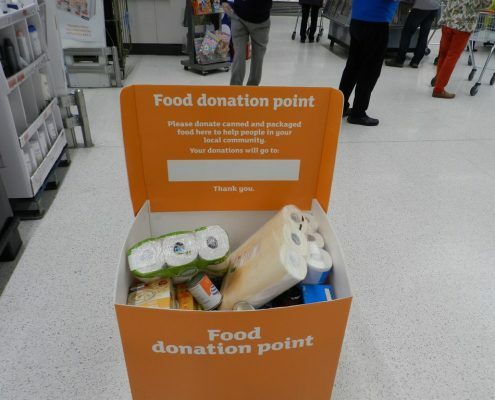 This is much appreciated by all who receive them. 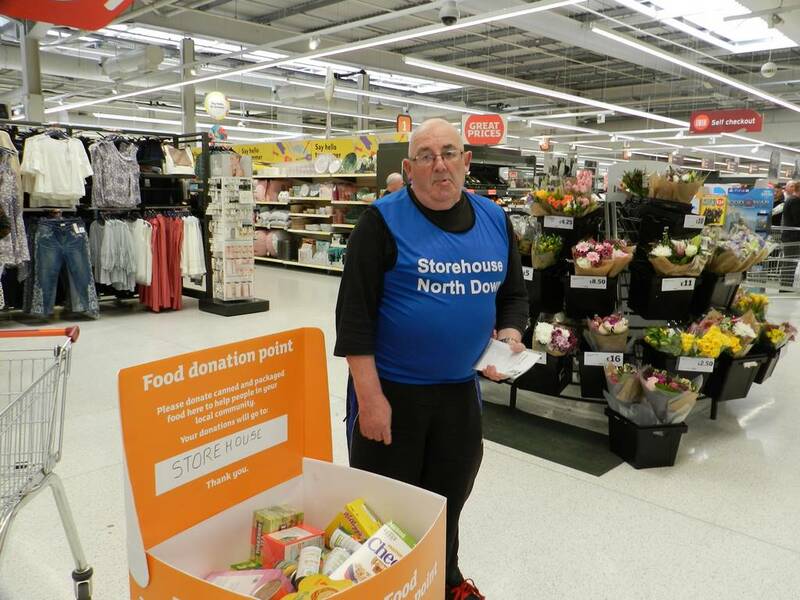 Storehouse North Down also supports Storehouse Lunch Club financially and by providing vegetables for the meals. 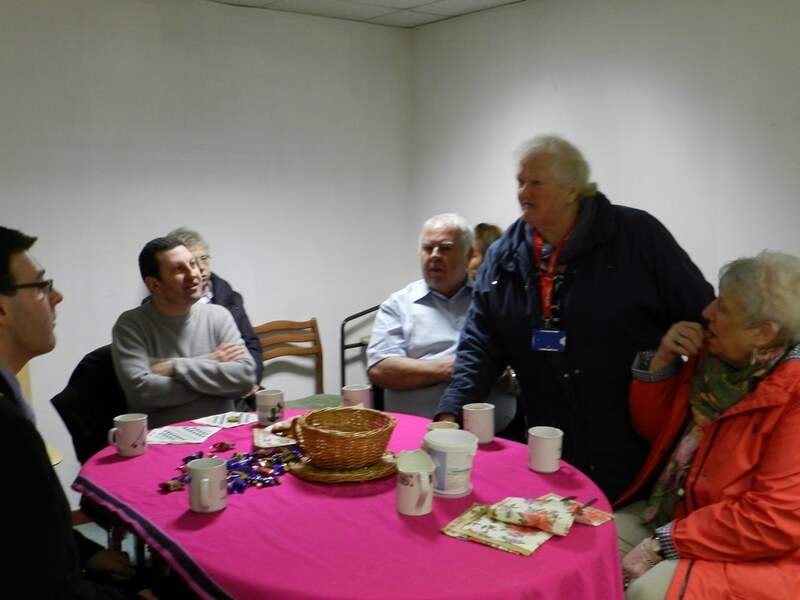 The lunch club, coordinated by Elizabeth Porter, provides a good 3-course Sunday lunch on alternate Sundays at YMCA in High Street, Bangor and has 4 teams of volunteers working on this. 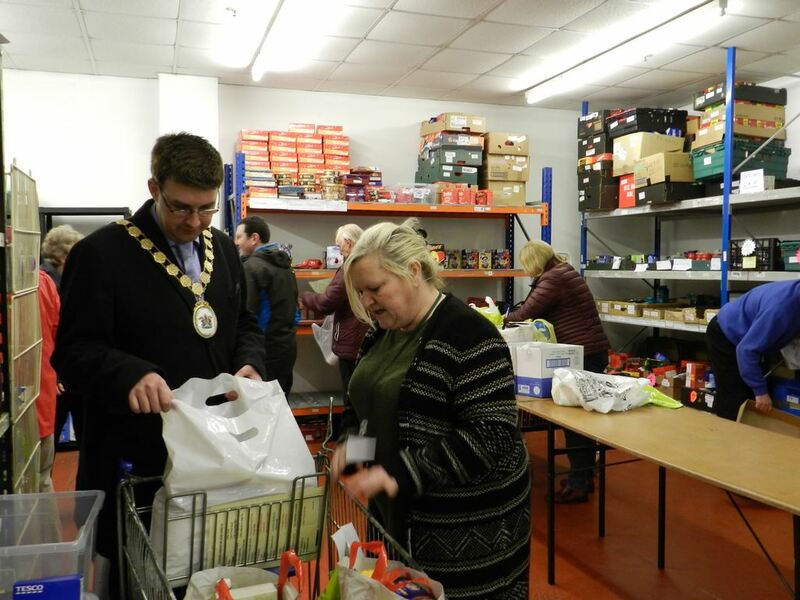 The invitation to the lunches is included in food hampers and sent to other charities in the area. 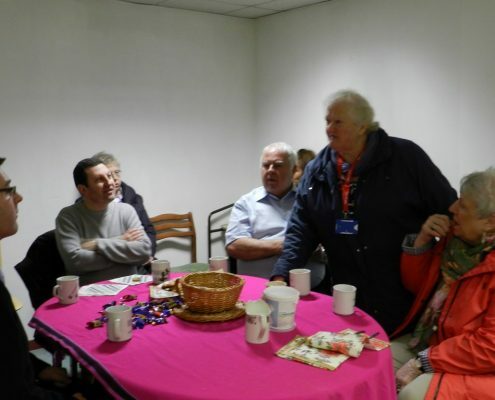 Mayor Robert Adair met all the volunteers who were working that day and was able to thank them for all their hard work over a cup of tea. 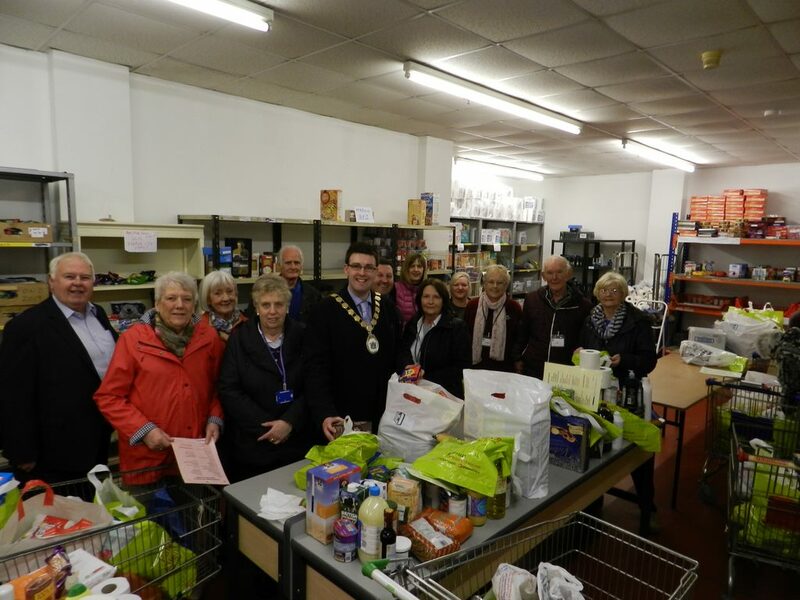 He expressed thanks on behalf of the Council and said how impressed he had been at their efforts to help others in need. 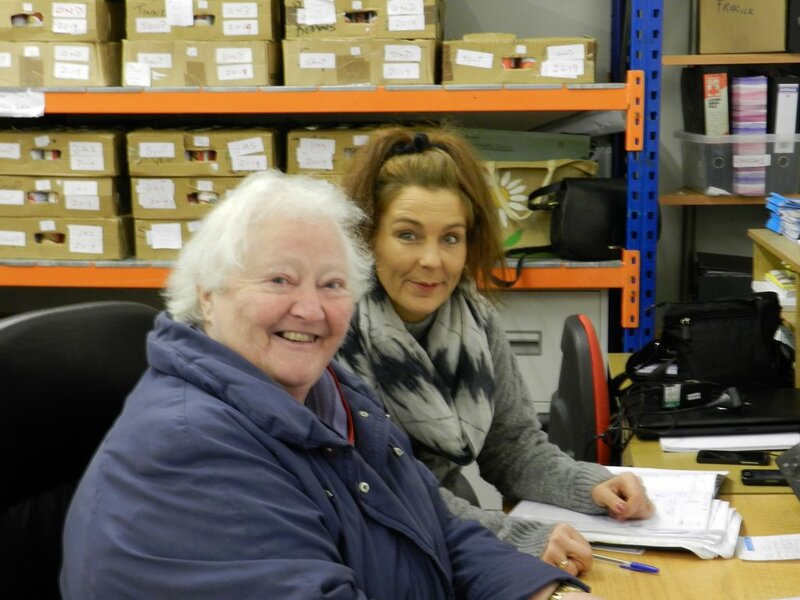 Margaret Bailie thanked the councillors for their support for Storehouse ND through a Community Grant last year. 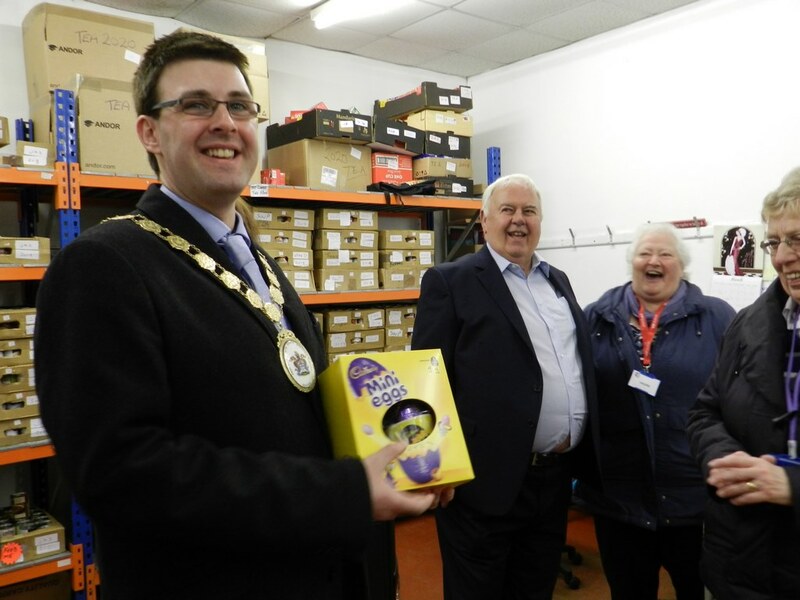 She presented the Mayor with an Easter egg and mug, much to his amusement!